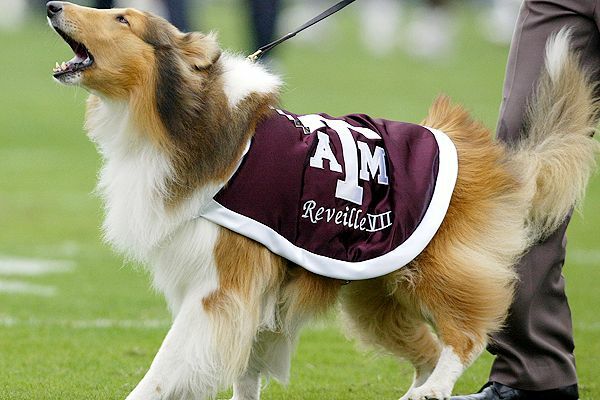 So apparently there is a tradition of having a Collie dog as a mascot for the Texas A&M college. If you would like to read more about Reveille click here. I of course, following my own tradition of offering crochet toys to expecting parents, was asked to try to make a crochet one for their first baby girl. After scouring the internet for a pattern and not finding one I liked, I saw a few images of this pattern for Abbey the Border Collie by NattyPat. I really liked the overall look and thought that with a few minor changes in color that it would serve my purpose. Cute face no? I liked the addition of the eyebrows. I used the same dark Toast brown color from the Dalek I did earlier and a creamy soft white. The head and body was a breeze to make. At first I was a little sad that the pup was so small overall, but once I got into making the mane of fur, I was really happy that it was not bigger. That would have made this project take forever! Sitting up with removable cape. I had a little trouble with the legs at the top, trying to make sure that they would pose right, but I think I got it in the end. The second thing that troubled me was the embroidery on the face and toes. I am a total novice at embroidery! I've only ever used the thread to make friendship bracelets as a girl scout. It took me a long time to figure out the face markings and eyebrows especially. I do feel like after this project, that I learned a new skill though! Underside, so you can see the mane and embroidery. I then used the same brown from the body, a slightly darker gray brown and the white yarn to make the mane. I tried to follow images of collies to see how the colors fade into each other. I then made her a quick little cape like the dogs wear, with the Texas A&M logo embroidered on it. Do u happen to still have the pattern for this? Ive been looking every where fot a pattern and i cant find one and ots not on nattypats site anymore. The pattern is still for sale on her site, the link that I used is just broken now.